Buy Health Drinks From India. 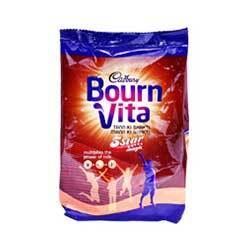 Bournvita 5 Star Magic, Bournvita Complan Memory Chargers, Complan, Boost, Maltova, Milo, Horlicks, Horlicks Lite, Women's Horlicks, Mother's Horlicks, Horlicks Pro Mind, Horlicks Gold Health Drinks Online Shop. 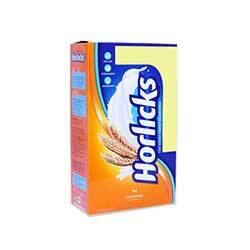 Horlicks The Great Family Nourisher -Horlicks is a delicious malt-based drink that can be enjoyed hot or cold. It consists of a unique blend of nourishing ingredients, which are scientifically formulated to provide vitamins, calcium and protein. All of this helps you and your family to restore and maintain energy and vitality levels. Apart from being a great tasting drink, Horlicks helps provide the nourishment essential for growing children. 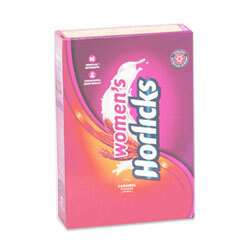 Women's Horlicks - Women's Horlicks is a complete list of micro nutrients for every woman. Women's Horlicks is recommended by World Health Organization (WHO). It consists of a unique blend of nourishing ingredients, which are scientifically formulated to provide vitamins, calcium and protein. 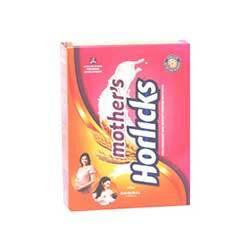 Mother's Horlicks - Mothers Horlicks is a unique formulation has an essential fatty acid called docosahexaenoic acid or DHA from a vegetarian source. Numerous studies have suggested that DHA helps in brain development of the child during pregnancy and the first few years of life. Mother's Horlicks has been manufactured through a natural process of malting or germination that helps to produce enzymes which in turn helps to breakdown complex starches and proteins into simpler molecules making it easy to digest. 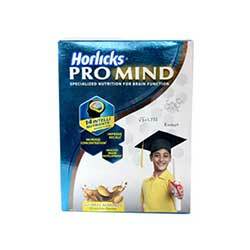 Horlicks Pro Mind - Is The Best Drink For The Body! with its unique combination of wheat, malted barley and milk ingredients. It is a uniquely delicious drink. Horlicks doesn’t just taste great one mug contains 12 essential vitamins and minerals and is a rich source of Vitamin D – an essential aid to calcium absorption . Horlicks Lite - Help in cell maintenance and tissue repair, make Lite Horlicks an ideal choice for adults. 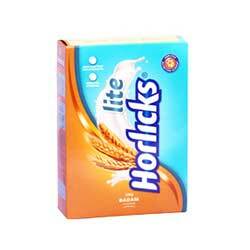 Lite horlicks Assurance : High in Protein 1 & Iron 1, Antioxidants Nutrients, Zero Cholesterol, No Added Sugar. Horlicks lite is specially designed to suit the nutritional needs of adults by providing quality protein and antioxidants for maintaining and repairing damaged body cells. The clinically approved contents in Horlicks Lite help fight fatigue and give strength and stamina. Horlicks Gold - Assurance : Clinically Proven Taller, Stronger, Sharper, 26 Vital Nutrients, Stamina Nutrients, Natural Ingredients - Horlicks is a delicious malt-based drink that can be enjoyed hot or cold. It consists of a unique blend of nourishing ingredients, which are scientifically formulated to provide vitamins, calcium and protein. All of this helps you and your family to restore and maintain energy and vitality levels. 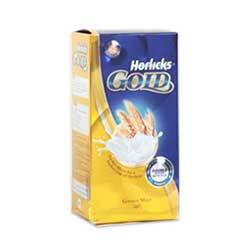 Apart from being a great tasting drink, Horlicks Gold helps provide the nourishment essential for growing children. Junior Horlicks Stage 1 (Original, Chocolate) - A superior formulation of 23 vital nutrients that gives you energy for a healthy body Junior Horlicks 1-2-3 an easy to digest* drink for the fussy toddler at home (*Junior horlicks is partially pre-digested, which helps make it easy to digest). 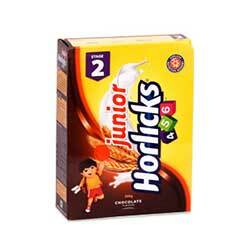 Junior Horlicks Stage 2 (Original, Chocolate) With Growth Boosters - Growth boosters are : Protein, Calcium, Vitamin D, Vitamin K and magnesium that are known to promote physical growth. 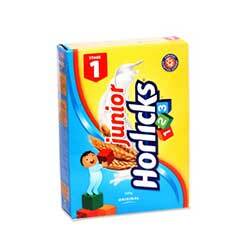 Junior Horlicks is scientifically designed with 4 Power Vitamins and 5 Growth Boosters to provide your child adequate energy to play in preschool and help his growth. Complan - Essential for rapid growth, development and maintenance of body. Source of energy and mental alertness. Strong and healthy bones and teeth. Help maintain water balance in the body. Keep you mentally sharp, alert and physically active. Build immunity and help develop body resistance to fight infection, Efficient conversion of food to energy.Keep the nervous system healthy. 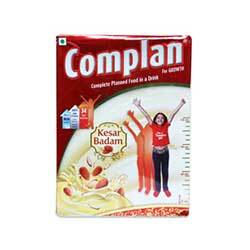 Complan Kesar Badam - The Complete Planned food is a milk based nutritional health beverage fortified with 34 vital nutrients in balanced proportion including 100% Milk Protein to help in better child growth. 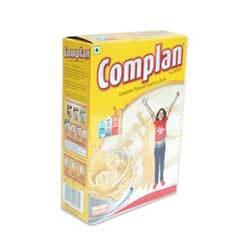 Complan is a nutrition expert in the category and its formulation is designed mainly as per Indian Recommended Dietary Allowances (RDA). Complan has more than 52% Milk solids and is a leading brand in Milk Products Categor. 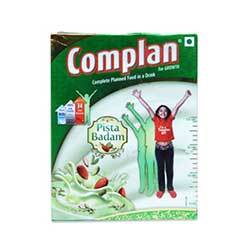 Complan Pista Badam - Complan is a food offering planned and balanced nutrition for the growth and development of children. Your child may be a fussy eater which may lead to nutrition gaps in his/her diet. Give him Complan. Complan provides your child balanced and adequate nutrition, which bridges key nutrition gaps in their diet and helps in children’s development. New Complan With Memory Chargers - Complan with Memory Chargers is a Complete Planned Food Offering Planned and balanced nutrition for growing children. It has all the all the nutritional goodness of Complan and is enriched with nutrients which help improve children's memory. Complan with Memory Chargers helps bridge nutritional gaps in the diet of children who are fussy eaters and aids their congnitive development. Complan With Memory Chargers Contains : 8 Memory Chargers : Enriched With Protein, Iron, Iodine, Zinc, Vitamin B6, Folic Acid,Vitamin B12 and Choline with aid congnitive development in growing children, thus helping them improve their memory. 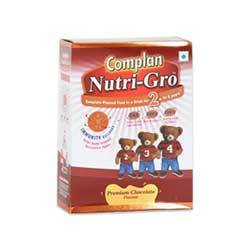 Complan Nutri-Gro - 8 Immunity Builders, which help build internal resistance to illnes like cough, cold, mild infections etc 8 Immunity Builders are : Vitamin A, vitamin E, Vitamin C, Zinc, Selenium, Copper, Molybdenum, FOS (Prebiotic). 2 to 4 years is a critical phase of growth for children. Mothers worry about their children's fussy eating habits as lack of adequate nutrition affects growth during these formative years. Healthy food and nutrition for kids is top priority at this stage of life. Inadequate nutrition also weakens immunity (the body's internal resistance to fight illnesses) at a time when children's exposure to the unprotected environment outside home increases. Presenting Complan NutriGro, a complete planned food in a drink for kids and is specially designed for 2 to 4 year old children. It provides balanced nutrition and helps build immunity, which in turn maximizes children’s growth potential. 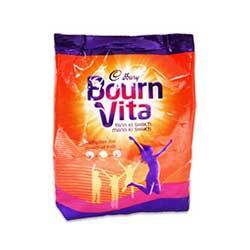 Cadbury Bournvita - Development of strong bones - Bournvita multiplies the power of milk and provides the essential nutrients to growing children. Bournvita 5 Star Magic - combination of Vitamin D, Vitamin C and Iron, along with other essential vitamins, minerals and natural ingredients gives shakti by multiplying the power of milk. This shakti helps prepare your child to be a winner. 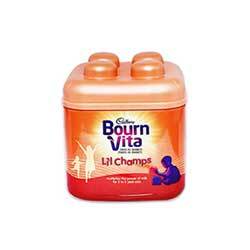 Bournvita Lil Champs - is specially made for young ones who require special nutrition for growth - DHA Omega 3 is a natural building block of the brain and also aids eye development. But it is not commonly found in the averge indian diet. Whey Protein, a high quality protein, is needed for buildinig and repairing of musces and tissues. 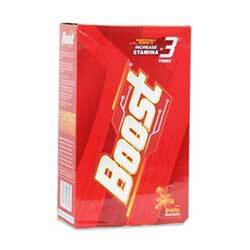 Boost - Boost is one of the leading malt-based Health Food Drink in a chocolate flavor. This drink is enriched with EnVita Nutrients, a unique scientific combination of essential vitamins and minerals that significantly improve the levels of key nutrients, important for energy metabolism to help increase stamina. 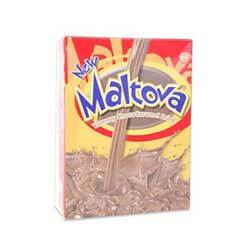 Maltova Yummy ChocoCaramel Drink - is extremely tasty, and makes nourishment truly enjoyable and exciting. To kids Maltova is the fun health drink, which is extremely tasty, and makes nourishment truly enjoyable and exciting. To ensure that Maltova stays fresh, transfer the contents of this pack immediately upon opening, into an airtight container. Milo Health Drink - is naturally rich in carbohydrates (including starches and maltose), the preferred energy source for the brain, nervous system and working muscles. Malted barley is one of the key ingredients that give MILO the unique great taste and crunch you love. It is naturally rich in carbohydrates (including starches and maltose), the preferred energy source for the brain, nervous system and working muscles. 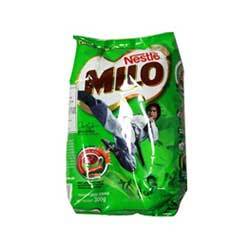 Including calcium, MILO contains 6 essential vitamins and minerals. Together with milk it is a nutrient rich drink for active kids. Nestle Lactogen 1 - Infant Formula Powder - is a spray dried infant formula for infants from birth when they are not breastfed. Nestle Lactogen 2 - Follow-up Formula Powder - Nestle LACTOGEN 2 is a spray dried follow up formula designed for healthy infants as the liquid part of the diet during and after weaning. It is not to be used as a breast milk substitute during the first six months of life. 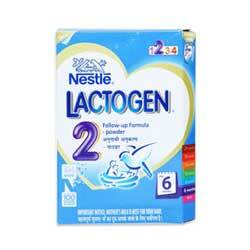 Nestle LACTOGEN 2 contains maltodextrin which is easy to digest and nutrients that support growth & brain development. Infant almost triple their weight by 1st year of life. An infant needs important nutrients like protein, minerals and vitamins that are essential for growth & development.Nestle LACTOGEN 2 contains 12 minerals and 14 vitamins. Nestle Lactogen 3 - Follow-up Formula Powder - Nestle LACTOGEN 3 is a spray dried follow up formula designed for older infants after 12 months as the liquid part of the weaning diet. 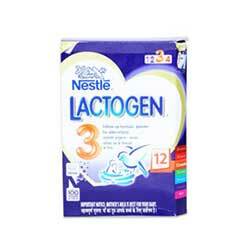 Nestle LACTOGEN 3 contains maltodextrin which is easy to digest and nutrients that support growth & brain development. An infant needs important nutrients like protein, minerals and vitamins that are essential for growth & brain development. 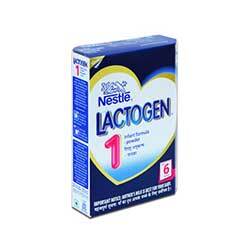 Nestle LACTOGEN 3 contains 12 minerals and vitamins. 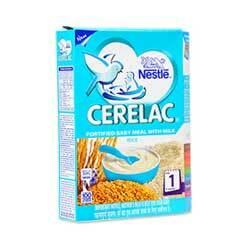 Nestle Cerelac Stage 1 Fortified Baby Meal With Milk First Food - First introduction to gentle solid food. Smooth texture with no bite makes it easy to swallow. Complex carbohydrates are broken into smaller and easier to digest components. 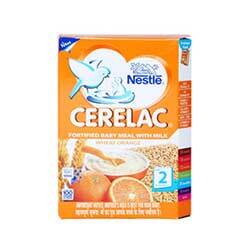 Nestle Cerelac Stage 2 Fortified Baby Meal With Milk - Contains a variety of fruits/vegetables combinations to gradully expose the infant to new tastes. Introduce bite with added textured bits. 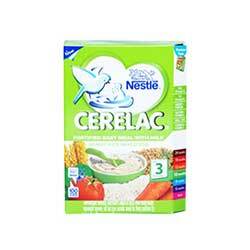 Nestle Cerelac Stage 3 Fortified Baby Meal With Milk - Exposure to new fruits/vegetables and multiple cereal combinations. Complex texture to increase bite/chew. 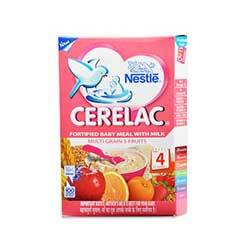 Nestle Cerelac Multi Grain 5 Fruits - Stage 4 Fortified Baby Meal With Milk - Contains multiple cereals + multiple fruits/vegetables. Crunchier texture for the growing baby. Abbott Mama's Best - Your nutrition during pregnancy and breastfeeding has a significant impact on your health and the growth & development of the baby. 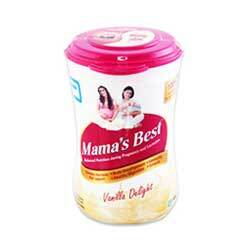 Mama’s Best is a specially designed nutritional supplement that supports balanced nutrition in pregnant and breastfeeding women. It contains nutrients that helps support the growth and development of the baby – Brain Development, Immunity, Growth and Healthy Digestion - and helps meet the nutritional needs of the mother during pregnancy and breastfeeding. Abbott Ensure - Vanilla Flavour Nutritional Powder - Ensure Powder, when mixed with water, makes a drink that provides complete and balanced nutrition for use as a meal replacement, or as a supplement. Specially Formulated with a fat blens to support your health, Ensure provides essential fatty acids and is low in saturated fat and cholesterol for people who desire a healthy diet. 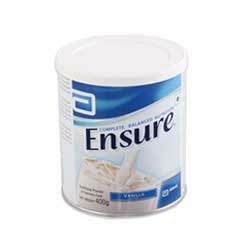 Ensure also contains a natural source of fructo-oligosaccharides (FOS) for gut health. Ensure may be used to supplement the diet, to increase caloric and protein intake, or to maintain good nutrition. Additionally, Ensure may be substituted for meals, or portions of meals.